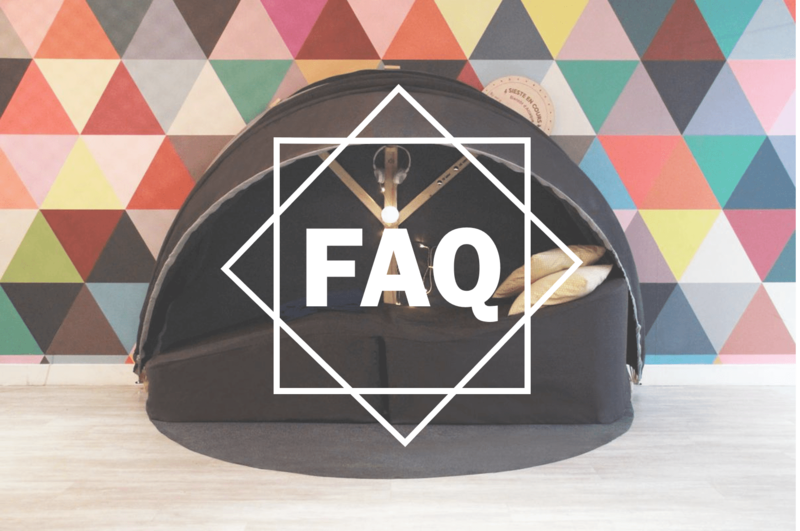 First question, I would like to install a napping area in my company premises but I only have a small room… What are the napping cocoon’s dimensions ? The Nap&Up cocoon is 220cm long and 70cm wide when open and 150cm when closed. It is very flexible, it folds and unfolds in less than five minutes which allows it to easily adapt to all configurations (for instance, a space can be used as a conference room in the morning and a napping room in the afternoon). To give you a precise example, we have already installed two napping cocoons in 8m2 rooms. Do I need to have a space entirely dedicated to napping ? Where must I NOT install the cocoon ? In the middle of the cafeteria, right next to the manager’s office, in the middle of the entry hall… Preference should be given to a calm and farely isolated area. But once again, you don’t need to have four walls and a dedicated area. But then, how many cocoons do I have to install according to the amount of co-workers ? One for each co-worker ! 🙂 No, of course not… We advice our clients to order two napping cocoons for 150 co-workers. This also allows you to firstly test how many co-workers use it and to increase the number of cocoons from there on. Why should I install a napping area in my company ? It has been proven that power napping is an important performance factor, it reduces stress and allows concentration to increase. Studies show that 80% of French occasionally feel tired during a work day and 72% of them feel that it has a negative impact on their work. Comparatively, it has been proven that a 20 minutes power nap allows a 35% increase in productivity and creativity and more importantly it decreases stress and regulates people’s temper. So, are you still doubting ? Yes, I am still doubting… What do I risk ? Not much other than having rested and more productive co-workers. But if you are afraid that they might linger too long inside the cocoon, Nap&Up has everything planned ! Upon our arrival in your premises we establish a booking system with 20 minutes slots, this allows co-workers to book their nap in advance and to not exceed their time. Furthermore, one of our options consists in ading a stopwatch on the outside of the cocoon. The napper presses the start button when enterring the cocoon, this way the people on the outside know how much time is left before the cocoon will be free again. Will there be a time slot when the cocoons might be saturated ? Même si le cocon à sieste risque d’être complet à cette période là, il sera également occupé à d’autres heures de la journée, comme le matin ou avant déjeuner (pour les personnes se levant tôt, ayant assisté à une réunion ou se préparant pour une grosse après-midi) mais également en fin de journée. So should there be opening hours for the napping cocoon ? We generally advice our clients to keep the space open all day long for the same reasons explained above. If a co-worker naps five times a day, could he/she be liable to a dismissal ? No… not to that extend ! However, initiating dialogue by taking an apointment with them and reminding them of some rules could be a good start. Is the napping cocoon sound proof ? Yes, with the audio headgear. We chose a thin fabric for when the cocoon is closed so that people suffering from claustraphobia can feel at ease (see the photo below). The napping cocoon can be delivered with audio guides which allow the person to completely disconnect from his/her suroundings. If you don’t have a proper napping area and that you think that there are too many interfering noises around the cocoon, we advise you to buy a headgear that actively reduces sound. How can I test the napping cocoon without commiting in the long term ? We offer our clients two starter packages and we often do event presentations so that people can test the cocoons. These events can spread out over a week (NapWeek) or a wellness day (NapDay)… meaning that they are custom made for you ! For further information you can check out our website. Many people share your fear… but we assure you that you will go back to work ;). An alarm clock is integrated in the audio guide and we help you go back to work energised. If you are really afraid of falling in the arms of Morpheus, we advise you to set an additional alarm on your mobile phone. And as a last resort, the person having booked right after you will wake you up ! It is up to you ! My company has a resting area, how do I book a nap and have access to the audio guides ? Lucky youuuu ! We wish you peaceful naps ! Once you have created your account, you will be redirected to the booking platform where the only thing left to do is to book your nap. For the audio guides, scroll down a little further and tadammmm there they are ! How do I cancel or change my nap ? It is really easy to cancel a nap ! In your personnal space, underneath the booking calender you will find your booking that you can cancel. If you wish to change the day and hour, cancel your nap and book a new one ! We have everything figured out, you might have guessed, we would never have let you sleep in your neighbour’s sheets ! The napping cocoon is delivered with a box of protective fabric that covers the whole length of the cocoon (from the pillow to the feet). This fabric is individual and recyclable. We advise you to keep it after your nap and to use the same one for your next naps. After having used it 4 or 5 times, you can throw it away in a proper recycling bin. Furthermmore, our seat covers and cushions are washable. There are no more valuable excuses not to go napping ! I am claustraphobic and the idea of being inside the closed cocoons frightens me… Should I be scared ? It is completely normal to be a little anxious about getting inside the cocoon. But don’t be ! We have had the cocoon tested by claustraphobic people and everything went smoothly. Indeed, we advise you to test it by lying down, once the cocoon is closed you will realise just how much space there is inside. Furthermore, the hull is made out of thin fabric which allows it to be opened easily and some daylight to pass through so that you are not in complete darkness. I am fairly big, can I still use the cocoon ? Will I manage to sleep on my side ? We have tried it and managed ! It is up to you to find the most suitable position but it is genuinely possible to sleep on your side.